Learn how quick and easy it is to upcycle any wall decor by adding decoupage on wood. My daughter is now 15 years old and wanted to update her tween bedroom. And of course, I didn’t want to spend much money because frankly, I’m cheap (if you haven’t figured that out by now!). We painted the walls grey and I bought her a cute Harry Potter bedspread and now I’m slowly taking the rest of teal and coral out of the room. Did I mention we painted it over Christmas break?? So changing up the rest of the room has been on my to-do list for months. On the top of my to-do list: to upcycle the wood hanger signs. When the theme of this month’s Craft Lightning Challenge came out, it finally gave me the push I needed to just do it. 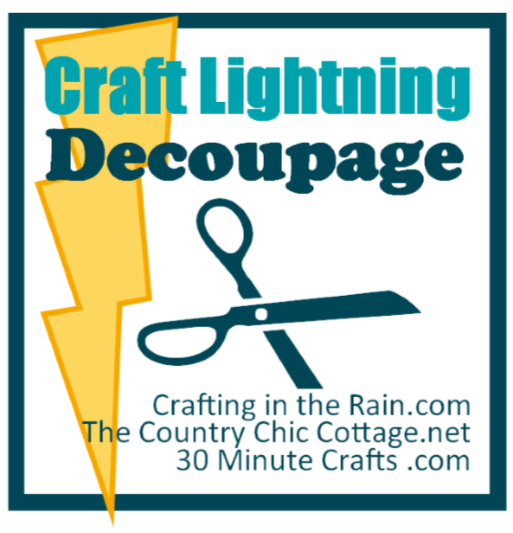 This month’s Lightning Challenge hosted by thecountrychiccottage.net, 30minutecrafts, and craftingintherain.com was decoupage. You might remember when I decoupaged a napkin on a glass vase, but this time I am going to show you how to decoupage on wood decor for pretty much free! You probably have these basic craft items somewhere in your house, so get them out and update a wood picture! If you actually want to transfer a picture to wood, make sure to check out my DIY teen gift idea post. Disclosure: This post contains affiliate links from Amazon and Cricut.com. I receive a small commission at no cost to you when you make a purchase using my links (purple text). These were the simple wood block hangers that I bought from Ross or Marshall’s years ago. I found some cute pictures on pixabay.com that represented what my daughter loves – music, books, musical theater. The signs are 4.5×4.5″ so I printed the pictures so that they were about 5″ square on white cardstock. I used cardstock since the backgrounds were pretty colorful and I didn’t think printer paper would cover the colors fully. You don’t need to use cardstock to decoupage. You can use napkins, magazine pictures, photos, printed paper, etc. Apply a nice even layer of mod podge over the wood. Place the trimmed cardstock on the mod podge and press down. Use a scraper or old credit card to scrape it down. Some glue will push out, just wipe it off with a paper towel. Having it pressed down with mod podge covering every little section on the bottom will prevent bubbles from forming. Let these fully dry! I let mine sit overnight to ensure they are completely dry. Then apply another thin layer of mod podge over the top of the picture. Make sure to get the edges and wipe off any excess mod podge. Once the glue is dry (about an hour or so), you can paint the sides and edges if you want. I used black acrylic paint and went over the edges and sides. That’s it! A super quick and easy way to upcycle some old wall art. Make sure to check out the short video to see how easy it is. If the video is not here, it’s at the top or side of your screen! Turn the volume on for the full instructions. What kind of pictures would you put on yours? Mine probably would have tools, sleep, and wine! Upcycle any old wall decor into something unique! Learn how easy it is to decoupage on wood. Find photos, magazine pictures, or print your own images onto cardstock or paper. Trim image to fit on wood sign. Apply a thin layer of Mod Podge, covering the entire bottom surface. Add picture on top and scrape down with scraper or old credit card. Wipe off any glue that comes out the sides. Let Completely Dry!! Overnight is best. Apply another thin layer of Mod Podge over the top and edges of cardstock to seal it. Let dry for an hour. Optional- paint the edges with acrylic or chalk paint. Hang back up and enjoy your new totally unique wall art! See post for more detailed step by step video and picture instructions.